In order for Orion and many of your other software systems/integrations to work properly, your firm needs to make sure it is using a fully supported version of Windows (Windows 7 or better). Our payment processing partner, OpenEdge, recently sent out a support bulletin to inform clients that they must be installed with a supported operating system in order to be compliant with their security certificates. CHICAGO–(BUSINESS WIRE)–Orion Law Management Systems, Inc. (www.orionlaw.com), a leading provider of financial and practice management software for law firms, announces iOrion Version 3.0, an enhanced and fully integrated Apple iOS and Google Android compatible mobile app. Building on the success of previous versions of iOrion, the updated app includes new features, platform compatibility and app integration. This version will be made available to existing iOrion subscribers at no additional cost, just in time for ABA TECHSHOW® in Chicago today. Get ready to mark your calendars, you won’t want to miss this! 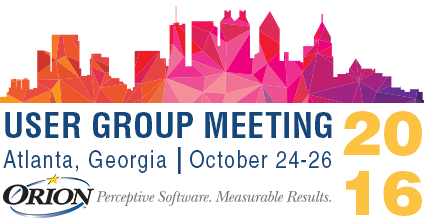 Orion is pleased to announce the date for our much anticipated 2016 User Group Meeting. The 3-day event for Orion Clients only will be taking place October 24-26, 2016 at the Omni Atlanta Hotel at CNN Center in exciting Atlanta, GA.
Windows 10 launched globally on July 29, 2015. Do you know what enhancements are included in this release? Below, we have listed some of the key highlights. If you were unable to participate in our latest webinar, good news! The recording is now available for you to view. Click the link below to watch this informative webinar hosted by Orion and Affinity Consulting Group. As benefit of our partnership with Affinity Consulting Group, we will be offering a FREE webinar hosted by Debbie Foster of Affinity and Kevin Harris of Orion. Many of you will remember Debbie Foster from Orion’s 2014 User Group Meeting. She presented on the importance of Process Mapping and received rave reviews from our attendees. This is a great opportunity to enhance your knowledge, make sure you sign up to secure your spot today!